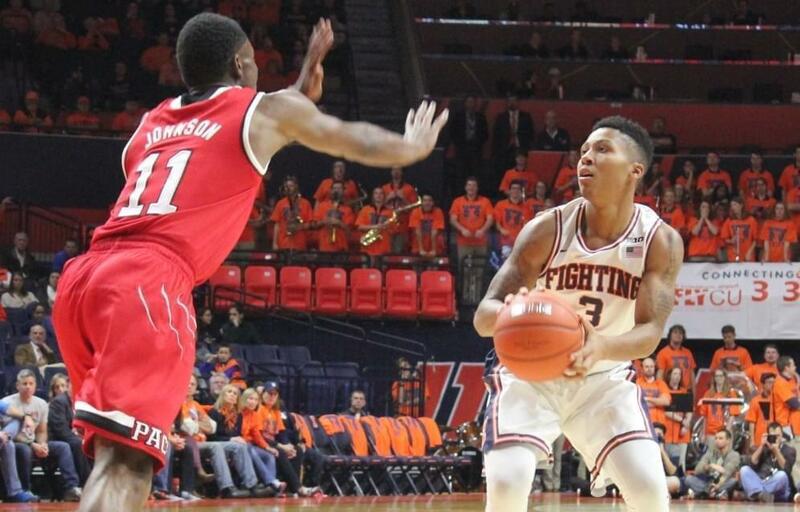 The Illini men's basketball team broke a three-game losing streak with a comfortable 88-74 win over North Carolina State in Tuesday night's ACC-Big Ten Challenge match at the State Farm Center in Champaign. The victory came during a night that was also marked by the official dedication of the renovated State Farm Center, following a 3-year, $170 million makeover. Illinois shot 68% from the field in the second-half of the game, and forced the Wolfpack to commit 19 turnovers. 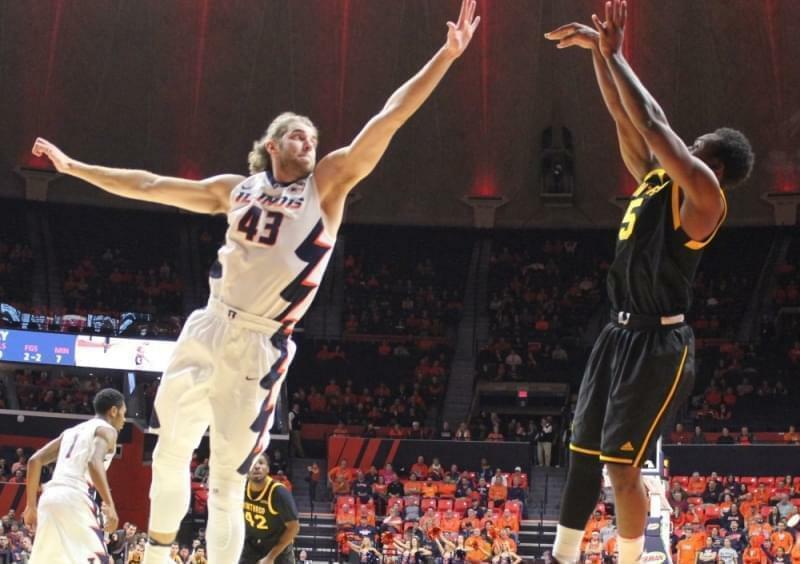 The Illini limited their own miscues to eleven. Illini Malcolm Hill (right) tricks NC State's Torin Dorn with a shot fake during Illinois' 88-74 win in Champaign Tuesday night. Malcolm Hill led all players in both scoring and rebounds with 22 points and nine boards. 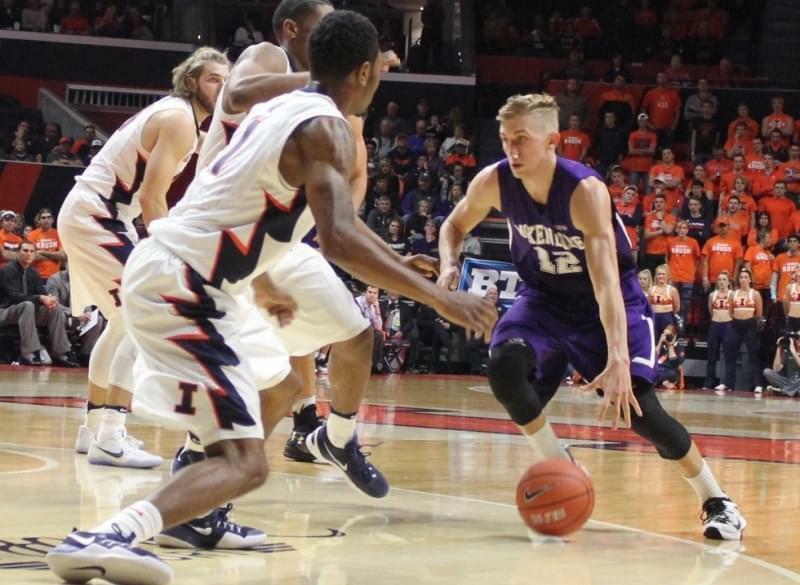 Hill was also the top assist man for Illinois, with four. Tracy Abrams scored 17 along with three steals. He connected on 3-of-5 shots from three-point range, as did Jalen Coleman-Lands, who finished with 11 points. Leron Black added 15 points and 8 rebounds for the Illini. He said afterward that the team is just beginning to gel, and pointed out that due to various injuries over the last three years, many of his teammates had no experience playing with one another. "I had never played with Tracy before", said Black. "I had never played with J-Cole (Coleman-Lands) before. So I feel like, as the games go by, we're just getting better as a team, and getting more chemistry." Illini coach John Groce agreed with Black's assessment. Groce said he hasn't had a team with so many available players since his final year at the University of Ohio in 2012. He admitted it's a challenge to lead a team with so many interchangeable parts. "With our strength in numbers, minutes may vary more so that normal, versus playing maybe a six or seven man rotation", said Groce. "Are we going to embrace that --- that that could be a real strength for us?" Torin Dorn led the Wolfpack with 17 points and 7 rebounds. NC State drops to 5-and-2 on the season.The Illini improve to 5-and-3. They'll travel to Miami this weekend for a game with Virginia Commonwealth.